"Enjoy this cold and refreshing treat with your annual pumpkin pie dessert." Combine the ice cream, ice, pumpkin, half-and-half, rum, and 1/4 teaspoon pumpkin pie spice in a blender; blend until smooth. 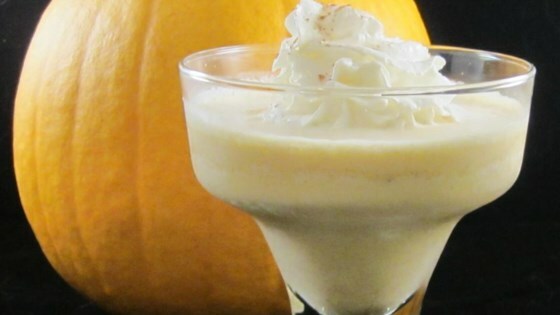 Pour into a serving glass; top with whipped topping, sprinkle with pinch of pumpkin pie spice. Great for a Halloween or Thanksgiving party. I skipped the ice and used regular milk instead of cream. Just remember to drink it before it melts! A fun, novelty cocktail for the holidays. I wonder how this compares to Harvest Grand Pumpkin Spice Cream Liqueur? When I made it as written we were really disappointed with the flavor which did not taste like pumpkin pie. A good bit of tweeking made this drinkable, but not something I would make again.